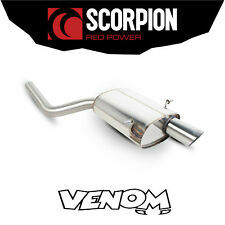 Scorpion Non Resonated DPF Back Exhaust System - STEALTH. VW T5 Transporter & Caravelle 2003-2015. T5 1.9 TDi (03-09). You will have to cut your original exhaust off behind the DPF. No welding required! Here we have for sale Item- EXCELLENT used for around 50 miles so is almost new. FOR THE BMW R56 MINI COOPER. But the real difference is the way a Scorpion feels. No other exhaust feels like a Scorpion because no other exhaust is created with our passion. And that's one thing which can never be copied. DECAT PIPE - CAT BYPASS. DECAT PIPE. RENAULT CLIO 182 AND 182 CUP. But the real difference is the way a Scorpion feels. No other exhaust feels like a Scorpion because no other exhaust is created with our passion. FOR THE BMW R50 MINI ONE. But the real difference is the way a Scorpion feels. No other exhaust feels like a Scorpion because no other exhaust is created with our passion. And that's one thing which can never be copied. 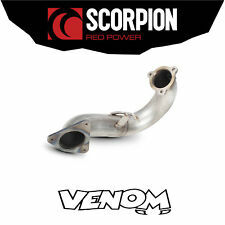 This Pipe is Designed To Replace The Scorpion Resonated Centre Silencer To Increase The Noise. Renault Clio 182 2.0 16v. 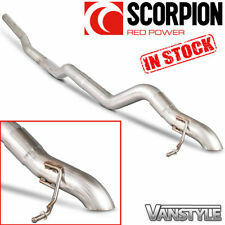 A Scorpion Stainless Steel Non-Res Centre Pipe -Louder. Non Res Centre Pipe Will Only Fit Onto A Scorpion Exhaust. Part number SRNC022. High Flow de-cat turbo downpipe. Northern Ireland, Southern Ireland, Highlands, Orkney, Shetland, Isle of Wight, Isle of Man. (Designed To Replace The Very Restrictive O.E Cat). Scorpion Audi TTRS Secondary Cat Bypass pipes - More sound and power! GIVES YOUR TTRS IMPROVED SOUND AND PERFORMANCE ALL FOR A BARGAIN PRICE. But the real difference is the way a Scorpion feels. No other exhaust feels like a Scorpion because no other exhaust is created with our passion. Mitsubishi Colt Z30 CZT 1.5T. A Scorpion Stainless Steel. Northern Ireland, Southern Ireland, Highlands, Orkney, Shetland, Isle of Wight, Isle of Man. Secondary De-Cat Pipe. (Removes The Standard Secondary Cat). VW Golf MK7 R Hatch & Estate. Golf R MK7.5 2017 -Up To Mid 2018 Non OPF/GPF -. De-Cat Downpipe. (Includes De-Cat Downpipe, Link Pipe & Adaptor Sleeve). (Fits To OE Centre or Scorpion). Audi S3 8v Quattro. Mini Cooper 1.6 MK2 R56. (Embossed with the Scorpion Logo). Northern Ireland, Southern Ireland, Highlands, Orkney, Shetland, Isle of Wight, Isle of Man. OE Exhaust System Has To Be Cut When Fitting. Actual Image of Exhaust. A Scorpion Stainless Steel Cat Back System (Resonated Quieter ). Northern Ireland, Southern Ireland, Highlands, Orkney, Shetland, Isle of Wight, Isle of Man. BMW Mini One & Cooper 1.6i. Single 100mm / 4" Round. 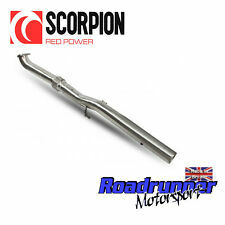 Scorpion Resonated DPF Back Exhaust System - STEALTH. VW T5 Transporter & Caravelle 2003-2015. T5 1.9 TDi (03-09). You will have to cut your original exhaust off behind the DPF. No welding required! FOR THE FIAT ABARTH 500 1.4 TURBO. But the real difference is the way a Scorpion feels. No other exhaust feels like a Scorpion because no other exhaust is created with our passion. And that's one thing which can never be copied. 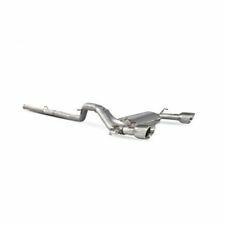 FOR THE MK1 FORD FOCUS ST170 2.0 DURATEC. FLEXI BACK EXHAUST SYSTEM. But the real difference is the way a Scorpion feels. No other exhaust feels like a Scorpion because no other exhaust is created with our passion. VW Golf MK4 GTI 1.8 TURBO. Northern Ireland, Southern Ireland, Highlands, Orkney, Shetland, Isle of Wight, Isle of Man. A Scorpion Stainless Steel Cat Back System. MONACO Twin Oval Rolled in (90mm x 76mm Each One). INCLUDES THE NEW SCORPION CENTRE PIPE WITH FLEX JOINT! SVXC067 (Secondary De-Cat Pipe). CORSA D VXR 1.6 TURBO. (Z16 Engine Only). A Scorpion Stainless Steel 3" Secondary De-Cat Pipe. Only fits to a Scorpion 3" cat back exhaust system. Northern Ireland, Southern Ireland, Highlands, Orkney, Shetland, Isle of Wight, Isle of Man. (Renault Clio 182 2.0 16v. A Scorpion Stainless Steel De Cat Pipe. Northern Ireland, Southern Ireland, Highlands, Orkney, Shetland, Isle of Wight, Isle of Man. or a Scorpion System). (Takes Out Standard Cat). VW Golf MK5 GTi 2.0. (Non-Resonated - Louder). Both products have been designed to be interchangeable with either the Scorpion or O.E system and both products have been developed in 76mm T304 stainless steel. 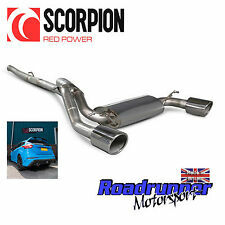 This Scorpion Exhaust Turbo Downpipe Decat is specially designed to fit the VW Golf Mk7 R & Audi S3 8V. Scorpion Part Number - SVAGC005. 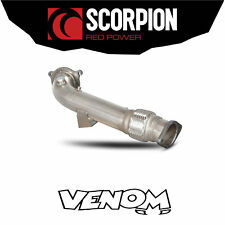 The Scorpion exhaust transforms performance and driveability and also gives your vehicle a sharper throttle response. CORSA D VXR 1.6 TURBO. (Non-Resonated - Louder). A Scorpion Stainless Steel 3" Cat Back System. Northern Ireland, Southern Ireland, Highlands, Orkney, Shetland, Isle of Wight, Isle of Man. Our highly competent sales team are always more than willing to help, whether you’re unsure of fitting specifications or just making an enquiry. Part Manufacturer: Scorpion. Part Number:SRNC019. Listed Part number: SRNC019. We also have a number of local branches around the country from which this item could be sold from. Audi TT MK2 Coupe 2.0 TDi Quattro. A Scorpion Stainless Steel Cat Back System. Northern Ireland, Southern Ireland, Highlands, Orkney, Shetland, Isle of Wight, Isle of Man. 1 x Twin STW Tail 83mm. (Includes Link Pipe & Rear Silencer). Astra H MK5 1.9 CDTI Diesel Hatch. A Scorpion Stainless Steel System. Northern Ireland, Southern Ireland, Highlands, Orkney, Shetland, Isle of Wight, Isle of Man. (To suit cars with no cut out in rear valance). A Scorpion Stainless Steel Back Box. Northern Ireland, Southern Ireland, Highlands, Orkney, Shetland, Isle of Wight, Isle of Man. BMW Mini One & Cooper 1.6i. (Fits onto A Standard Exhaust). Single 100mm / 4" Round. Astra H MK5 2.0 SRI Turbo. Astra MK5 1.4 1.6 1.8 & 1.9 CDTI Diesel. A Scorpion Stainless Steel Cat Back System. Northern Ireland, Southern Ireland, Highlands, Orkney, Shetland, Isle of Wight, Isle of Man. RESONATED CAT BACK EXHAUST SYSTEM. FOR THE BMW R56 MINI COOPER. But the real difference is the way a Scorpion feels. No other exhaust feels like a Scorpion because no other exhaust is created with our passion. VW Polo GTi 1.4 Tsi 6R. 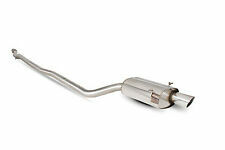 Stainless Steel De-Cat Turbo Downpipe With. Fits to OE & Scorpion Exhaust System. Northern Ireland, Southern Ireland, Highlands, Orkney, Shetland, Isle of Wight, Isle of Man. (Resonated - Quieter). VW Golf MK4. A Scorpion Stainless Steel Cat Back System. Northern Ireland, Southern Ireland, Highlands, Orkney, Shetland, Isle of Wight, Isle of Man. With Discrete Tail pipes. (Behind Rear Bumper). Ford Fiesta MK6 ST150. Northern Ireland, Southern Ireland, Highlands, Orkney, Shetland, Isle of Wight, Isle of Man. Fits To Standard or Scorpion. Our highly competent sales team are always more than willing to help, whether you’re unsure of fitting specifications or just making an enquiry. Mondeo 2.5T Titanium. Mondeo 2.5T Titanium Hatchback. Northern Ireland, Southern Ireland, Highlands, Orkney, Shetland, Isle of Wight, Isle of Man. New Stainless Steel De-Cat Pipe. (Takes Out Standard Cat).